Everything in life is cyclical; just look it up. Depending on your subject of interest, you can likely find some meditation on the cyclic nature of events in that particular field. Politics, history, sociology — heck, even opera has cycles. Baseball is no different. Whether it’s the dynamic between pitchers and hitters, strategic trends, or the success of individual teams, each side of the coin will come up eventually. One key area in baseball that exhibits this cyclic nature is in the relative strength of organizational prospect talent. Every year, we see various outlets publish their rankings of the league’s assorted farm systems, thus giving hope to downtrodden franchises everywhere. Baseball America just released their list, while Baseball Prospectus and John Sickels will surely follow soon with their own. As all these lists are published, it’s worthwhile to consider how clubs tend to navigate the crests and troughs of such rankings, and what that movement implies for a team’s future. Organizations or specific GMs tend to become aligned with a particular philosophy of how best to utilize a farm system. Dave Dombrowski, for example, has exhibited a tendency to trade prospects for established stars. The rankings illustrate this tendency. Looking at Baseball America’s organizational talent rankings from 2001 to 2018, one finds that Dombrowski had a bottom-10 farm system 10 times in his 14 years with the Tigers. Meanwhile, a small-market team like the Rays has a reputation for cultivating a collection of prospects who can help at the major-league level. The data supports this, as well: according to BA’s rankings, Tampa Bay has featured a top-five system seven times in the past 18 years. Even teams with established tendencies, however, still have their relative ups and downs. The Rays spent 2014-2017 as a mid-tier system ranked in the teens. Dombrowski had a couple of years early in his tenure with Detroit during which the system ranked in the top half of baseball. Even when a farm system is bad, there will be upticks. The Tigers’ 2012 farm ranking (No. 23) might seem pretty bad, but it was still a peak in rankings in between the troughs of 2009 (No. 28) and 2015 (No. 30). So what can this cyclic pattern tell us? The first question we need to consider is how long it takes a club to travel from the top to the bottom of the rankings, and vice versa. To get an idea of this, we first need to define what a “peak” and “trough” are in this context. 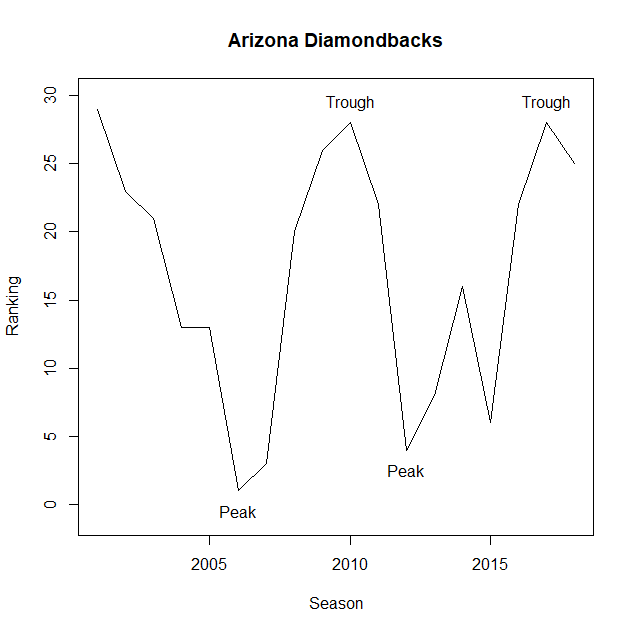 The Arizona Diamondbacks provide a useful example, in this case. Consider their rankings since 2001. 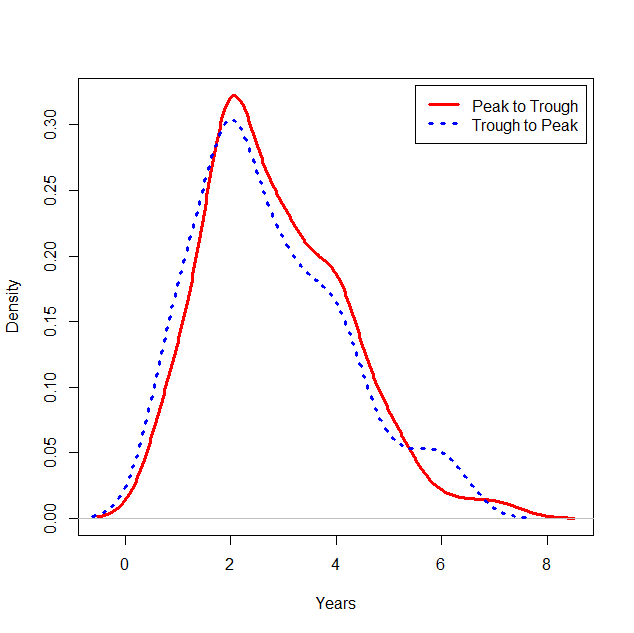 There are two clear peaks and troughs, with one possible mini-cycle in 2014-15. However, for the purposes of these measures, we will only be counting the two clear peaks and two clear troughs. For some years and teams (the 2006-12 New York Mets, for example example), there are no clear peaks or troughs, with alternating rises and falls each year. On average, it takes 2.8 years to go from the end of a peak to the end of the trough. It takes almost an identical amount of time (2.75 years) to go from the end of a trough to the end of the peak. However, the distribution of both peak-to-trough and trough-to-peak movement is skewed out to the right, with a few long rises and slow drops. The most common wait until the worm turns (in either direction) is two years. The next question is how far teams rise and fall in their journey from peak to trough and trough to peak. Intuitively, one would suspect that a longer duration between extremes would equate to a greater rise or fall in the ranks. This is reflected in the data. What we can also see is how symmetrical the peak-to-trough and trough-to-peak are in the relationship, having nearly identical rates of change given the length of the decline/rise. 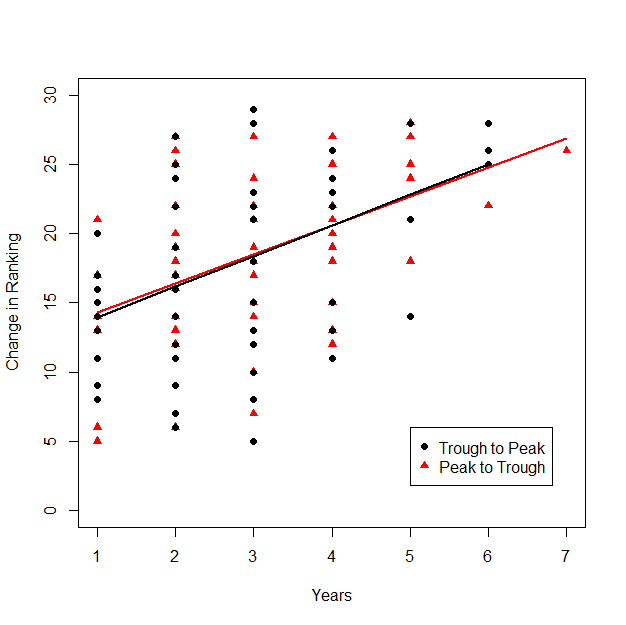 On average, teams experience a trough-to-peak change of 17.8 spots upward in the rankings, while a peak-to-trough change averages 18.1 spots downward. The precise numbers are highly dependent on how long a club is falling or rising, of course, with longer runs resulting in greater changes. Finally, we have to ask what happens at the end of these cycles. What happens in the years after an organization’s long steady rise — like what the Cubs experienced from 2009 through 2016? What about if that steady rise is followed by a quick descent — again, like the Cubs of recent years? Unsurprisingly, the clubs that go through longer periods of rise see more wins on average in the three years following their peak. Periods of quick rises or quick drops produce similar results on average, while long steady falls through the rankings result in the worst average win totals. Looking at what preceded each of these changes shows the clear importance of a long run towards the top of the organizational ranks. That infusion of talent can help stave off brief downturns in a farm system and can even mitigate a longer run of lesser talent. The Dodgers, Astros, and Cubs all have created their success in part by extending the upward swing of their respective cycles. With this in mind, it’s easy to understand the excitment of the Phillies and White Sox, as they have also made a long consistent rise up the ranks. On the opposite end, the worries of the Orioles and Marlins, who are coming out of long downturns without long rises preceeding it, seem completely founded. But what all these fans need to remember is that, at some point, the second face of Janus will turn towards your team. The strong systems will descend into a trough and the weak will reach their peak, and the next cycle of talent will begin for every team. We hoped you liked reading Farm Systems Are Cyclical by Stephen Loftus! One thing I want to point out is that the ranks of farm systems are not linear in the sense that the gap between 1st and 6th place is generally much larger than the gap between 25th and 30th. So the typical gain in value of jumping up 20 spots is going to be larger than the twice the typical gain in value of jumping up 10 spots.